The old story is that whatever you're doing on the first day of the new year is what you'll find yourself doing most often throughout the year. Not ones to leave anything to chance, Jeff Durniak and I beat a path to the Chattooga River on Sunday hoping to enjoy one last day of spring-like weather before winter finally rolls into north Georgia. Pulling into the South Carolina parking lot, we were encouraged to find only three other vehicles. As we're getting geared up, a white sedan pulls in and out hops a young fellow obviously anxious to hit the river. Never one to shy away from a conversation with other anglers, Jeff begins asking questions right away. "Paw Paw, Michigan but I'm visiting my sister in Anderson. 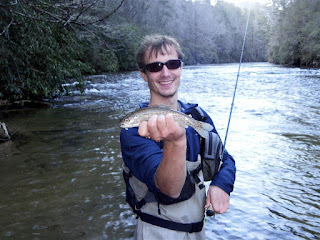 I mostly fish for steelhead but needed to get out on a stream somewhere and this is the closest one." "What rod do you have?" "Ha! Well, all I have with me is a 7 weight." "That's okay, we'll just stand on the bank behind you and catch the fish as you yank them out of the river." By the time we left the parking lot, Kevin was in tow as our new fishing buddy and Jeff's telling him embarrassing stories about some of my previous fishing exploits. At least he's limiting it to fishing stories so I'm relieved. We give Kevin a brief seminar on fishing the Chattooga in gin clear water conditions with the backup plan to come find us upstream if things aren't working out. For Jeff and me, things begin working out right away. As he sits on the bank rigging up, I immediately hook into a fish with my double nymph rig. At the same time, Jeff's noticing a few bugs hovering over the river and even sees a flash of silver below the surface as a rainbow considers coming up for the stonefly and changes its mind at the last moment. As Jeff wades into the water, I ask what he's tied on. The smile on his face hints that he's going to fish a dry fly.... on January first! 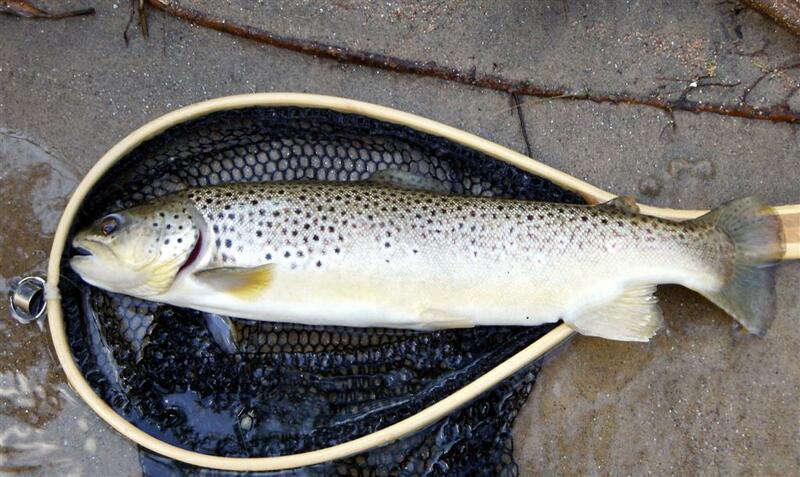 I move downstream to one of my favorite runs where another angler has just exited the river. Before I make my first cast, Jeff is hooting Rabunite style as he's hooked his first of many fish on the #14 Parachute Adams. 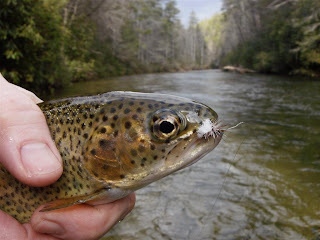 My nymph rig proceeds to provide me with the hat trick (rainbow, brown and brookie) from this great little spot so we're both hooting and hollering up and down the river. Anyone who's never fished with a Rabunite would have thought we were still celebrating the New Year. We were, the only difference is that we were high on life. A short while later, Kevin rounds the bend. He's hooked three or four and brought one of them to hand. We spend the rest of the afternoon fishing with Kevin and are amazed at his line management skills, a must when steelheading. We all continue catching fish in with our own personal techniques. Jeff and I getting an education on how to get long, drag-free drifts and Kevin learning the art of dredging with 12' to 15' leaders. All in all it was a great day on the river. Not a tremendous number of fish caught but enough to keep us there until dark. 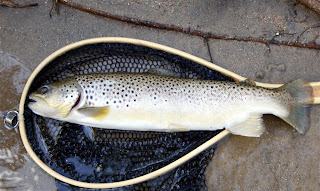 Jeff landed a big brown that almost spooled him when hooked in the pectoral fin and I netted a big, pretty 18-inch brown from a shallow riffle on a blue stonefly nymph pattern. I had no camera so you'll just have to take my word for it. And best of all, we made a new friend on the river. Can a year get off to a better start?